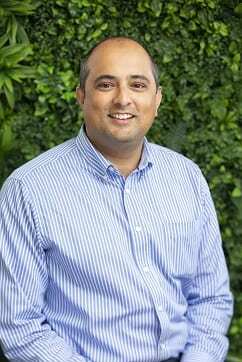 Siddhartha (Sid) Baxi is an oncologist working within the clinical oncology network of specialists at John Flynn Hospital (linked with Tweed Valley Hospital), and our Southport Centre (linked with Pindara and Gold Coast Private Hospital). With a decade of experience gained from the establishment of the Alan Walker Cancer Centre, Darwin and South West Radiation Oncology Service in Bunbury WA. Dr Baxi brings a strategic and horizon view of healthcare, bringing together clinical and innovation endeavours for the benefit of our patients. Technologically adept at utilising stereotactic body radiation therapy (SABR), Sid led the establishment of the liver tumours stereotactic radiation therapy program allowing non-invasive treatments for liver tumours. His leadership roles focus on advocacy via the consumer groups; as a Faculty member for the Australian College (RANZCR) and protocol developments via the national eviq.org.au. “I feel strongly that we should be able to bring care and access to all Australians and continue to support regional Queensland clinically and in an advocacy capacity. Much of my research initiatives are focused on our Aboriginal cancer care challenges in regional and remote Australia”. His life experience is diverse given his community work as Local Government Councillor for Shire of Capel (2013-2017), Advisory Board member of Edith Cowan University Bunbury (2015-2017) and Board member of Dalyellup High School (2016-2017). He currently continues to work in medical innovations with colleagues at Circada Innovations and as clinical reference expert for Bellberry Human Research Ethics Committee.